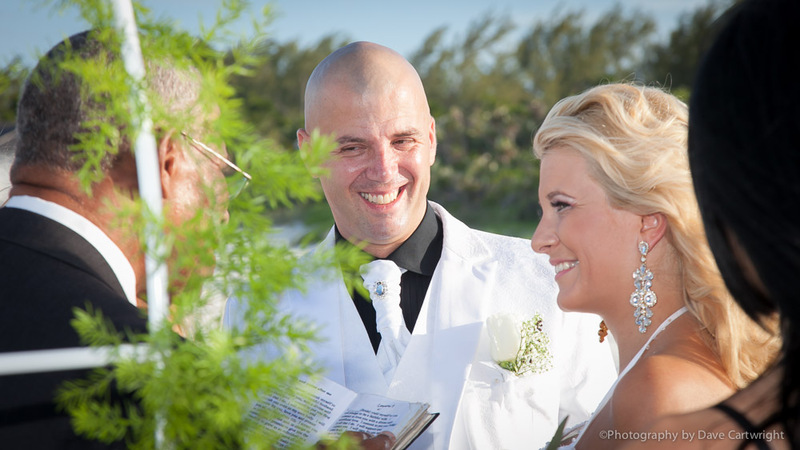 Real Weddings Bahamas on Eleuthera and Harbour Island feature the lovely couple Katya and Rosen from Bulgaria. Katya’s dream was a chic beach wedding in the Bahamas. A stunning oceanside wedding is indeed what she got. The couple and two friends flew via their private plane from Bulgaria to Eleuthera to bring Katya’s dream wedding to reality. The four flew eight hours a day over five days with stops in Great Britain, Germany, Greenland, Canada and Miami before making their way to Eleuthera. Another two friends were picked up in Miami to join the intimate wedding group. Here Katya and Rosen are pictured as Bahamas Marriage Officer Joshua Culmer performed their unique ceremony, complete with tying of the rope and a shell basket gift. A villa on the private island of Windermere was the Bahamas wedding location. The couple chose Provender House where Princess Di stayed on her honeymoon. Located on spectacular beachfront, this setting was the perfect spot for the couple to tie the knot. The 6:30 p.m. ceremony on June 30, 2016 was performed by Joshua Culmer, Justice of the Peace. Lighthearted and fun, the evening event was enjoyed by all. We highlight a preview of photos shot by fine art photographer Dave Cartwright. Katya’s stunning one-of-a-kind wedding dress was with Swarovski crystals, designed and made by a friend, flow in the balmy breezes. Beachside fun and frolic continued into the evening as Katya and Rosen celebrated their wedding. Platters of cold meats were served as the couple toasted with Champagne. Then, it was on to the main course of the dinner of grilled fish, chicken, potato salad and vegetables. A rum cake was served for dessert. Chic Bahamas Weddings is happy to plan your Bahamas wedding at a hotel, resort or villa on any one of our islands. Contact us today to start planning. Bulgarian music filled the air as the group partied into the evening.